The Chase British Airways Visa Signature® Card is currently giving away up to 100,000 bonus Avios points for qualifying purchases! After you spend $1,000 with your card within the first 3 months of account opening, you’ll get 50,000 Avios points. If you spend $10,000 in the first year, you’ll get 25,000 more Avios points. If you spend a total of $20K with your card in the first year, they will throw in an additional 25,000 Avios for a grand total of 100K bonus Avios points! Sign up now for this great bonus opportunity that can be redeemed for a round-trip business class flight! There are a good number of credit cards available in the market. They all have their own features, terms and benefits. One of the most popular of these is the Chase British Airways Visa Signature Card. 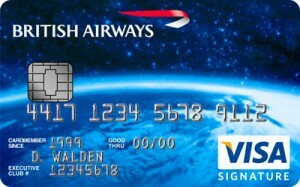 This is a credit card issued by British Airways to its clients and customers in association with Chase Bank. It is primarily targeted at the flying public. Passengers who use this card will be able to earn enough bonus points towards a round trip award within the first year as a member. According to the issuer, the Chase British Airways Visa Signature Card is the best choice for international travelers and offers them various options and benefits. The most prominent benefit is the one where customers are able to earn bonus avios in relation to business class round trip which is awarded within the first year. This process will see the participants earn about 50,000 points for every $1000 they spend using the card in the first 3 months of membership or account opening. Another benefit that accrues is a further 25000 points that are awarded when the customer purchases products and services worth about $10000 within the first year of owning their Chase British Airways Visa Signature Card. There is an additional benefit that this card offers its holders. This is an additional 25000 bonus points, also referred to as Avios when a card holder spends about $10,000 using the card within the first year. All these points, earned within a member’s first year since account opening will add up to a total of 100,000 points or Avios. These Avios are absolutely enough to warrant a round trip in business class to any destination. However, the regular taxes and fees will apply where necessary, such as airport taxes and so on. One of the benefits that this card offers its members is that it comes with smart chip technology. This modern technology is absolutely essential in maintaining security of the Chase British Airways Visa Signature Card. The user will be safe and protected from fraud and other illegal activity. The card also allows purchases in countries within Europe and elsewhere. Apart from these benefits, passengers get to earn points for any other purchases they make on British Airways and all other purchases. For example, a passenger will earn 2.5 Avios or points for every single dollar they spend of British Airways while they earn 1.25 points for every $1 they spend elsewhere using the Chase British Airways Visa Signature Card. Customers will be pleased to learn that they will not be charged any fees on the foreign purchases they make while overseas. While the norm in the industry is to charge transaction fees for expenditure overseas, this cost is waived, allowing travelers to spend more during their travels overseas. Passengers who spend $30,000 or more within a year get to earn ticket referred to as Travel Together Ticket. This ticket is good for two years and users can redeem the ticket for a flight to any destination they choose. All these benefits are available to customers at an annual fee of only $95. For anyone out there who is looking to take a big trip, the British Airways Visa Signature® Card’s companion ticket offer(worth $500 or more a year) is gonna be one of the most enticing bonuses out there. Additionally, you’ll earn 25% more rewards than the standard airline card rewards rate of 2.5 Avios per $1 spent on British Airways/1.25 Avios per $1 spent elsewhere. Don’t wait any longer to apply for this card so you can start earning bonus Avios today!